HDI is an established composite indicator. Time series of HDI are now available for selected years for the period 1980-2011 in the UNDP Human Development Report 2011. From the same data a broader dynamic view can be established if the usual static statistical measures are complemented with S-time-matrix format, S-time-distance and S-time-step measures to analyse intertemporal changes in composite indicators. The position is that HDI analysis needs a two-dimensional dynamic framework: static disparity and time distance perspective. The analysis contains analysis of 187 countries subdivided into the four human development groups: very high, high, medium, and low. 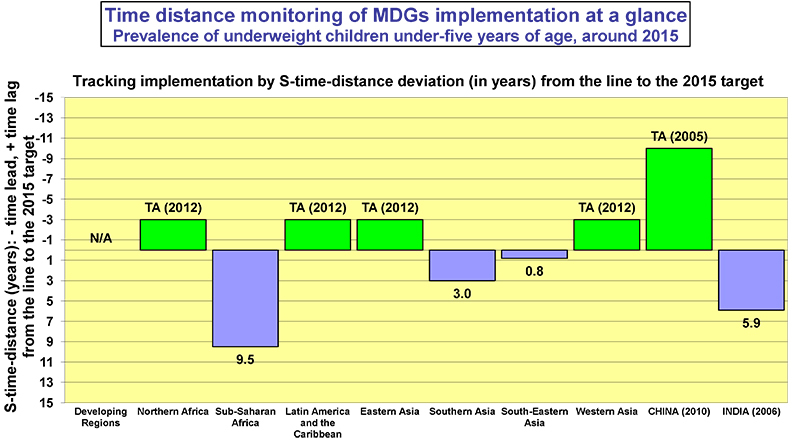 For each of the groups the countries are presented in time matrices for selected HDI levels and in the corresponding time matrices for S-time-step estimates, for the available data for the period 1980-2011. In addition to that, summary matrices present the world view over four HD groups and world regions, for BRICS countries and for selected countries from all groups to cover the whole range of 187 countries. The range of HDI values over the three decades is 0.18 - 0.94. There were substantial improvements but disparities remain very large. Time matrix format also provides a first level visualisation tool. China was one the best performers and it is selected as an interesting benchmark to which other countries are compared. China is still nearly 30 years behind Argentina at the lower end of the very high human development group; in turn Argentina is about 30 years behind the leading countries like Norway and Australia. About 20 countries of the low group have still not reached the level of China in 1980. To indicate the magnitude of the time lag between the lowest and the highest countries we can use indicator life expectancy: the two thirds of the low HD group are lagging benchmark Sweden between 90 and 130 years. The most important conclusion of the analysis is that different measures provide very different perceptions of the order of magnitude of disparities: 1. static disparities in HDI appeared small; 2. time distances in HDI were large. For a more realistic dynamic picture we need both. Empirical facts e.g. show that the degree of the disparity for the HDI in time perspective is large between and within HD groups: very high group is leading the high group by more than 31 years, medium group is falling behind the high group for 27 years, low group is lagging medium group for 24 years. There are many other empirical conclusions that cannot be mentioned in the summary like the world view over four groups for Health, Education, and Income Index. S-time-step indicates how many years were needed to reach the next level of indicator. The greatest HDI dynamics was in medium group, which needed 1.5 years to increase one level of the HDI; on the average for the other three HD groups S-time-step for HDI was between 2.2 and 2.4 years.